Size: * 15ct. 30ct. 60ct. Are these nextCBD Hemp Extract 2.5% Softgels Standardized? Yes, these nextCBD Hemp Extract 2.5% Softgels yield 10mg of active CBD per softgel. You use less and get more with nextCBD. In fact, 10mg nextCBD = 200mg regular CBD and 20mg nextCBD = 400mg regular CBD. nextCBD has much better absorption, so you don’t have to take as much. See below to learn more about what makes next CBD unique. What makes nextCBD CBD Oil Unique? The hemp plant contains many cannabinoids, one of which is cannabidiol (commonly referred to as CBD). 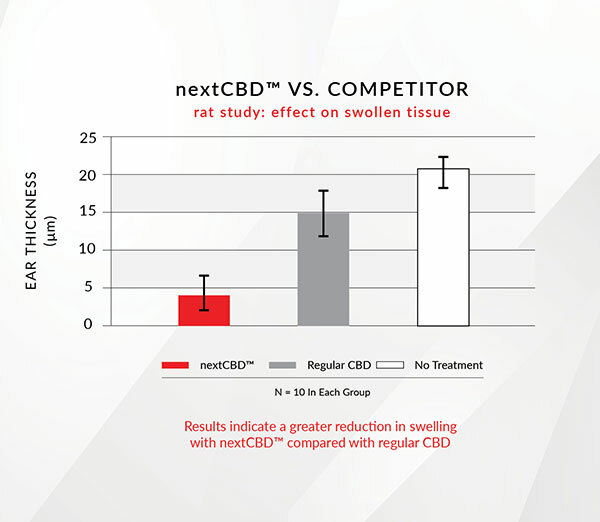 nextCBD is pure CBD extracted from hemp plants grown in the U.S., and then encased in a proprietary bioavailability matrix for superior absorption into the body, 20x that of the leading CBD competitor. 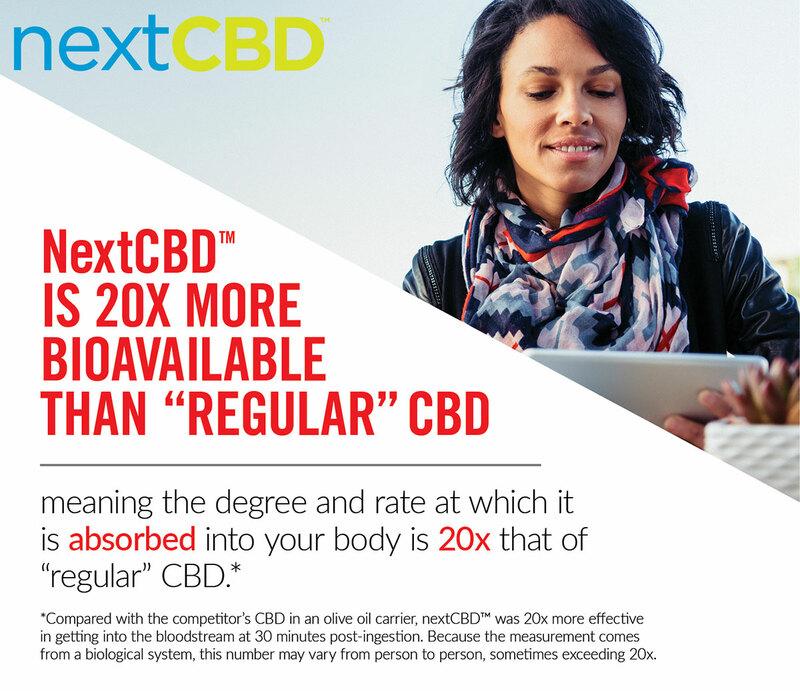 nextCBD is 20x more bioavailable than “regular” CBD, meaning the degree and rate at which it is absorbed into your body is 20x that of “regular” CBD. nextCBD is hemp-derived CBD and is not psychoactive. You use less and get more with nextCBD. 10mg nextCBD = 200mg regular CBD and 20mg nextCBD = 400mg regular CBD. nextCBD has much better absorption, so you don’t have to take as much. nextCBD is derived from hemp plants grown in the U.S.
nextCBD multi-patented technology encases the CBD in a shell that protects as it travels from the mouth to the bloodstream. CBD helps turn on endocannabinoid receptors in the brain and immune system. These receptors are key regulators of numerous mental and physical functions. nextCBD works in minutes and lasts for hours. nextCBD is NOT psychoactive and will NOT get you “high”. 99.5% of “regular” CBD isn’t absorbed requiring doses upwards of 200mg. nextCBD is fully water soluble which allows for better absorption and lower doses, around 10mg-20mg. nextCBD is derived from hemp, which is sustainable, fast-growing, and good for the earth. Take 1 nextCBD Hemp Extract softgel daily. To gain more insight, read the nextCBD CBD Oil reviews and experiences below. Nootropics Depot offers 15 count, 30 count, or 60 count jars of high quality nextCBD Hemp Extract 2.5% Softgels. Nootropics Depot's nextCBD Hemp Extract 2.5% Softgels have been lab tested for product purity and identity. nextCBD is protected by patents owned by ANANDA Scientific under distribution by Compound Solutions, Inc. Noticed a significant reduction in stress and being in a better mood from good sleep quality. I didn't get any benefit from this expensive product. Tried the recommended dose up to 3x that dose. No impact on mood, well being, or relaxation. But it seems like a quality product and it's possible others may benefit. This product works great for when I get headaches and need some relief. It really works well when I combine it with other supplements I have like curcumin and black seed extract. This is a CBD isolate. So there are no terpenes present like in some other CBD products. I would like to see Nootropics Depot bring out one with a full spectrum terpene profile too. I think that would be even more effective, as the terpenes in hemp have a lot of their own effects. I don’t get anything out of this. I read cbn oil could help with sleep but I didn’t feel a thing. I tried it during the day too and didn’t feel anything neither. I have really bad stress. 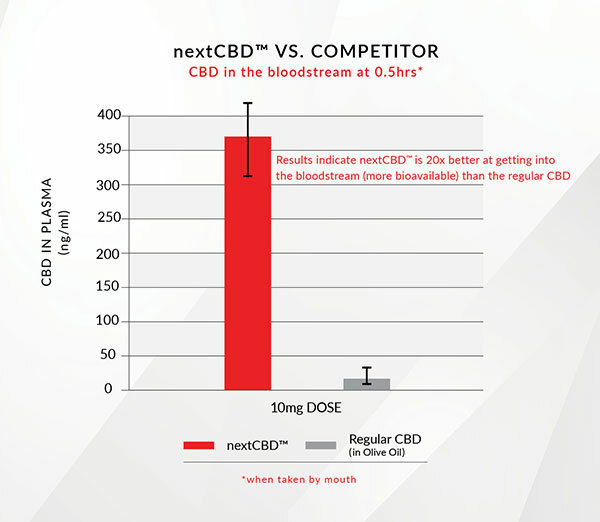 If I was to invest in other CBD products to get the same results as NextCBD, I would be unable to afford it. I like that with NextCBD I get more and use less. It is cost efficient, and potent. Could not ask for more. It helps with at least 70 to 80% of my stress. I will be a repeat customer.